Participants have to register on the online portal. Participants can submit their Abstract with the title according to the guidelines of IDA. Upon successful acceptance of Abstract, Participant (Non IDA Member) has to become IDA member before e-poster submission. “Failing to which, participant will be disqualified from AIPC”. The All India Poster Competition is open for all dental students of recognized dental colleges in India. Abstract selection letters will be sent by e-mail to each selected author and also displayed in ‘my message’ section of their abstract account. Author can track the status of their abstract by logging in his/her abstract account. All the notifications will also be displayed in ‘My message’ in your abstract account. 5. 1st round Presentations of posters to the reviewers (at select location WDS/IDC). Winners from 1st round will be called on the 3rd day of Indian Dental Conference 2017 for the Grand finale round of competition. 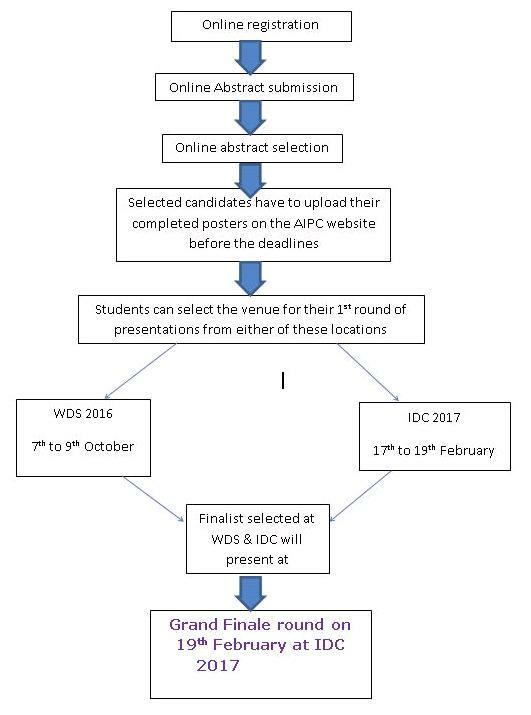 1st round presentations will be conducted for first 2 days of IDC(17th,18th February2017). Participants need to be present at the assigned slot for the Presentations. 6. Poster selection for Grand Finale round. 7. Grand Finale round presentation at IDC 2017.